Oct. 19- Permaculture in the City field Trip: National Renewable Energy Laboratories (NREL) & Golden Olden Cyclery home permaculture tour. We'll tour the National Renewable Energy Laboratory Visitor Center in Golden at 15013 Denver West Parkway Golden CO 80401. Then we will head a few miles over to Steve Stevens' house (Golden Oldy Cyclery) for a tour of his living museum: a "Net Zero Energy" home & old-time bicycle museum. Discover and explore the world of Fungi in a whole new light. Join us as we explore indigenous economic systems and decision making with Robert Chanate. We will explore how these models might work well today, especially as we move to create a more sustainable society, turning away from an industrial growth society. March 30- SPRING into Action: Developing & Implementing a Long-Term Vision for Sustainable Communities with Pavlos Stavropoulos. 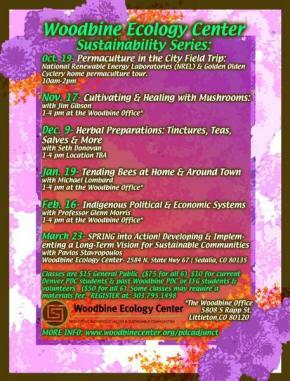 Classes are $15 General Public, $10 for current Denver PDC students & past Woodbine PDC or EFG students & volunteers. Some classes may require a materials fee. Get information on our events, workshops, specials, and more!